Aquariums come in different shapes and sizes. Some of the bigger ones can be found in public, like the aquariums you might have visited with your family when you were a kid. Such aquariums can contain fish of all kinds. There are small and medium-sized ones, and those that were probably much larger than yourself as a child. Medium or large aquariums are common in some people’s homes, or even as decoration in hotels and restaurants. But what about small ones? While fish bowls may be more popular in media, there is actually a more sustainable way of keeping your fish. It’s call the nano aquarium or nano reef tank. It can contain from 2 to 40 gallons of water, and is usually compact enough to be placed on your desk. W. In fact, it might even be quite challenging for you. Before you go and get one for yourself, however, take a look at some of the pros and cons of a nano reef tank. What are the best nano aquariums in the market? Coralife BiocubeMarineland ML90609 Portrait Aquarium KitPenn Plax Vertex Aquarium KitFluval Spec III Aquarium KitMarina LED Aquarium KitWhat’s the verdict? What Are The Pros And Cons Of A Nano Aquarium? Since it’s smaller than the average aquarium, it’s also cheaper to set up. For beginners who may just be trying things out, it may be more appealing to invest a small amount, in case you would end up not pursuing the hobby. There will also be less equipment . 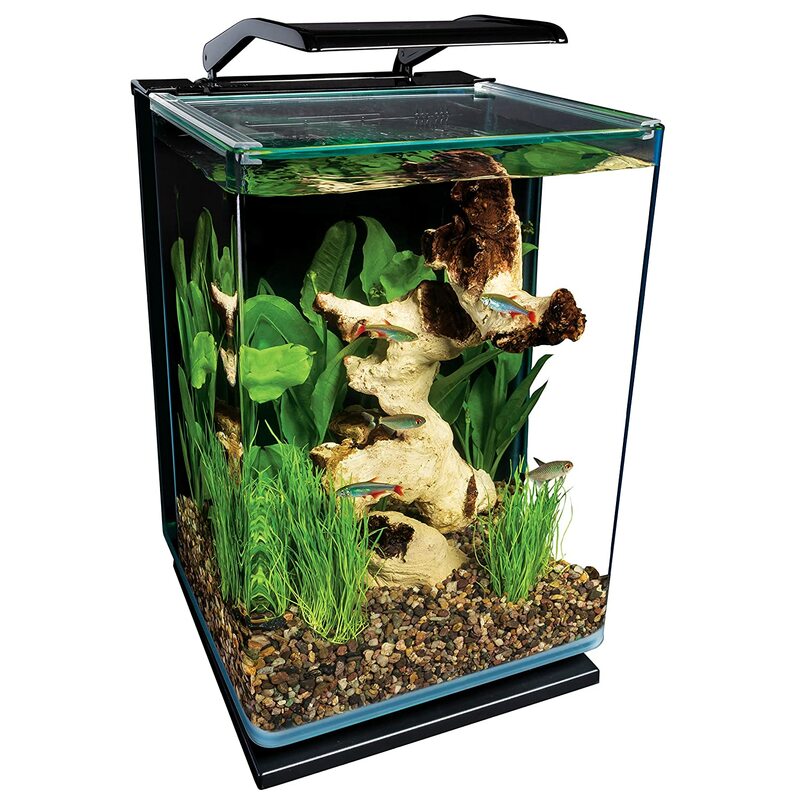 A nano aquarium would have no need for a sump, which means you wouldn’t have to worry about plumbing. Another item that will cost less is the lighting. In medium or large aquariums, the lighting is one of the most expensive pieces of equipment. The longer your tank, the more lighting you might need to usealso impacts your electricity bill. But with a nano reef tank, the lighting you need would not be as plenty compared to a regular aquarium. There are also nano aquarium kits that already come with lighting, which is good enough for soft corals or rock setups with fish. Imagine if you had to move to another house complicated would that be to transfer a 50-inch aquarium? One of the perks in getting a nano reef tank is the fact that it’s easier to transfer from one place to another, will also be safe to place upstairs. With larger tanks, you would need to consider the structural support of your house and ensure that the weight can be supported upstairs. Due to its lesser water volume, a nano aquarium may have less stability in salinity and nutrients. Changes in water quality and chemistry can occur faster than it does in a bigger tank. To keep the salinity parameters in good level, you may have to top it off with freshwater every other day. It sounds tedious, but there are aquariums that have an automatic top-off system installed. Because of the stability issues, you would also have to change the water at least once a week. Monitoring the tank would have to be more frequent as well for you to be able to provide a remedy if ever the stability issues cause problems. If you live in a tropical country, or somewhere that has a warmer climate, this may also cause more evaporation to occur. To avoid this, it would be ideal to keep the nano reef tank in a cooler room that has consistent temperature. Because we’re dealing with limited space, it’s a given that the amount of fish you can keep in your nano aquarium is limited too. Their compatibility with each other and with your reef. Choose fish or invertebrates that don’t grow too big. You might also have to do some research on these creatures’ habits. If you decide to keep invertebrates such as shrimps, and one of your fish happens to enjoy preying on them, it’s definitely not the ideal ones. Peaceful and calm aquatic life is more suitable for a nano aquarium. If they are not compatible with your corals, this could also lead to damage within the tank. If you are new to the hobby, the cons may sound daunting. However, it can also be great to start with something advanced as you will acquire skills that will help you in this hobby in the long run. If you’re a seasoned pro, you’re probably feeling challenged now and thinking of the ideal nano aquarium for you. No worries, we have a list coming up. What are the best nano aquariums in the market? Here are some of the top-rated nano reef tanks for you to choose from. 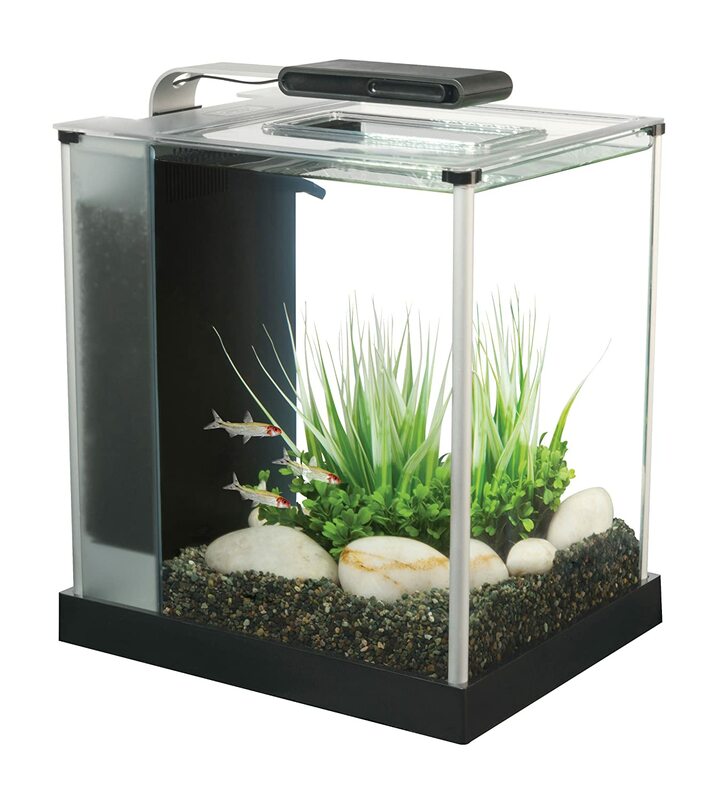 This nano aquarium can contain 23.5 gallons and has dimensions of 20 x 20.75 x 18.75. It weighs 54 pounds and is made of glass. The entire package consists of the tank, top cover, light filter, fan, and filter pump. It’s one of the kits that already include lighting, so there won’t be any need for you to buy additional lights. It is a kit, and contains the needed equipment. The corners are rounded so injuries can be prevented. Includes blue lighting that can make your aquarium look more like the ocean. Quite expensive, but you can consider the fact that it’s a set and it already includes most of the equipment; it also has a higher capacity of 23.5 gallons, which may explain the price. The fan inside the lid can be quite noisy, so it might not be ideal to place the item in a bedroom or office. With a 5-gallon capacity, this nano reef tank is sized at 16.8 inches high, 11.8 inches long, and 11.8 inches wide. It weighs 12 pounds. It comes with an advanced three-stage back panel filtration with an adjustable flow filter pump. This feature is hidden on the back of the tank, so that it does not obscure the aesthetics. The aquarium also comes with bright blue and white LED lights that includes daylight and moonlight settings. It includes a hinged light and a sliding glass canopy for easy access. As a kit, it includes all the equipment needed. Most of it are hidden in the back, so there is less noise and no bulky top. Since it has a smaller capacity, it is also more affordable. Blue and white LED lights and daylight/moonlight options that can enhance the aesthetic appeal of your nano reef tank. Has rounded edges to prevent injuries. Because the filter and other equipment are hidden in the back, it may be more difficult to clean. 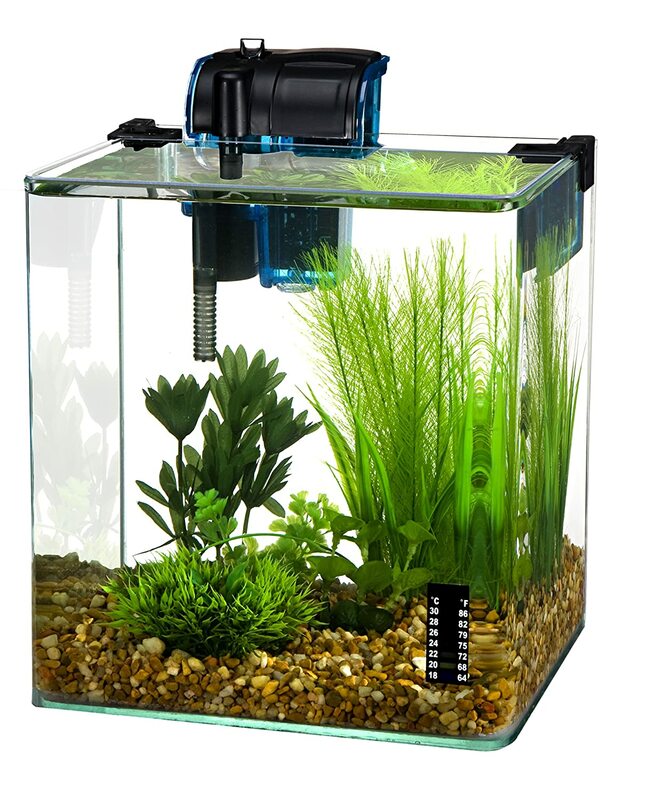 This 2.7-gallon capacity nano aquarium kit includes a hang-on water filter, an LCD stick-on thermometer, and a fish net. It is also recommended to beginner hobbyists. It weighs 6.9 pounds and measures 10 inches high by 8 inches wide and 9 inches long. Its glass is 1/8 inch thick, which makes it pretty durable despite its small size. It also has a frameless design, which allows you to view your fish and plants with no obstructions. Due to its small capacity, it is also affordable and suitable for spaces such as office desks. It comes with a thermometer, filter, and a fish net. The filter is quiet and has an adjustable flow rate. The tank also has rounded corners. Comes with a warranty, but the duration is unknown. Does not come with lightings so you would have to buy your own separately. This etched-glass tank with aluminum trim comes in two colors: black and white. You have the option of choosing the color you prefer, although the black one is more expensive by $4. It weighs at 10.1 pounds, and is 8.7 inches by 10.8 inches and 11.8 inches. The package includes 31 LED lights, an adjustable pump, a filter, a foam block, activated carbon, and BioMax bio rings. It’s specifically made for office desks and countertops, so if that’s where you want to place your nano aquarium, this tank is a good choice. Includes all of the things you need for setup, including lighting. The pump and filtration system are on the back, and does not make much noise. Even when set to the lowest setting, the filtration may be too strong for some types of fish, so depending on the fish you keep, you may need to modify the filtration system. 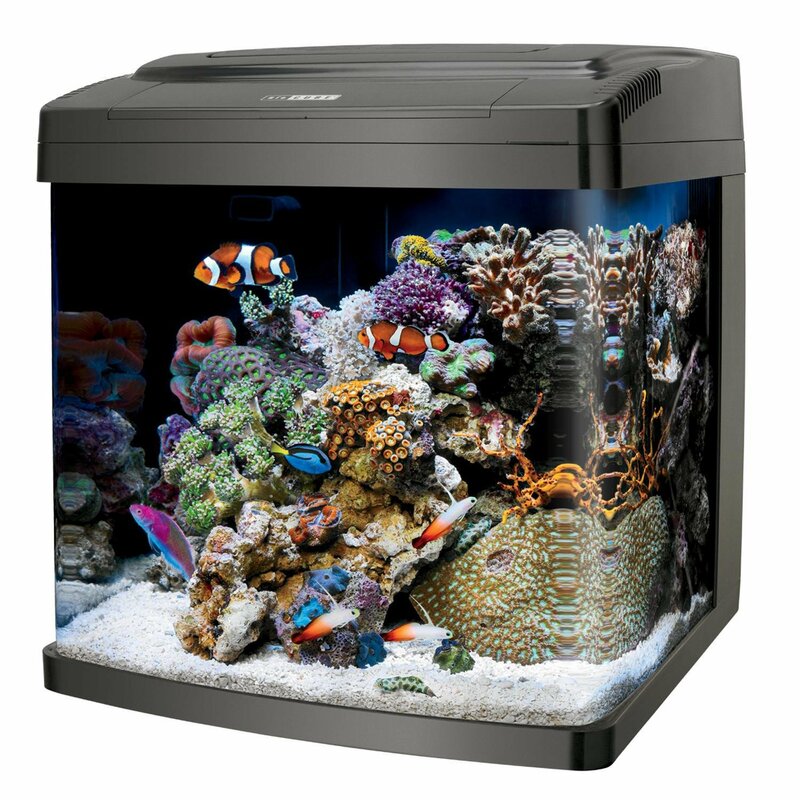 This nano reef tank comes in three sizes: 5 gallon, 10 gallon, and 20 gallon. It includes a Marina clip-on filter with quick-change cartridges, long-lasting LED lights with natural daylight effect, and all of the equipment needed for set up, such as the pump and filter. The package also comes with a net, fish food, a water conditioner that makes tap water safe for fish, and a supplement that helps create a healthy and well-balanced environment for your fish. Includes everything you need, plus extra items such as the fish food, water conditioner, and supplement. Rprice, considering everything that comes with it. Comes in multiple sizes so you have options to choose from. Filtration system does not make much noise. The corners of the tank are silicon that glues the glass together, instead of rounded glass—this gives less visibility. Of course, it ultimately depends on your needs. Take into consideration the type and amount of fish you’d like to keep. If you want a bigger environment, then you might want the 20-gallon models. If you prefer just a little decorations on your desk or countertop, however, then you might want to go for the 2 to 5-gallon ones. We find all of these tanks to be pretty awesome, but Marina LED Aquarium Kit takes the cake. It really does include everything you need and more. We were completely won over by the extra items such as fish food, water conditioner and supplements. These items would not only be helpful to seasoned hobbyists, but they would greatly help beginners as well. Not to mention, you get all that at a good price. 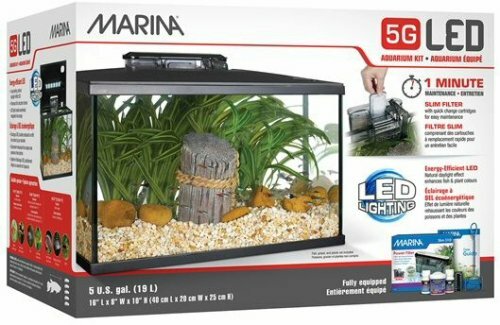 The Marina LED Aquarium Kit also comes in three sizes, which makes it a great choice, regardless of how much fish and plants you plan to keep. In the end, whichever aquarium you choose will surely be good for you and your fish. Tell us your pick in the comments section below!